Badly written, poorly directed and painfully low on laughs, The Dilemma struggles to find the right tone and ultimately fails to convince on an emotional level, despite a pair of better-than-the-film-deserves performances from Jennifer Connelly and Winona Ryder. 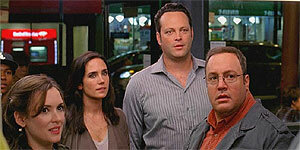 Directed by Ron Howard (yes, THAT Ron Howard – what he's doing here is anybody's guess), The Dilemma stars Vince Vaughn as Ronny Valentine, a recovering gambling addict who's embarking on a high-risk business venture with his best friend Nick (Kevin James) and trying to decide whether to propose to his long-suffering girlfriend Beth (Jennifer Connelly). However, when Ronny sees Nick's wife Geneva (Winona Ryder) kissing another man (Channing Tatum), he agonises over whether or not to tell him, knowing that an emotional upset could jeopardise their imminent business deal. The film's biggest problem is that Howard can't decide whether he's making a comedy or a drama and he struggles to find the right tone throughout, veering from painfully unfunny slapstick to supposedly weighty dramatic scenes, neither of which work. On top of that, the film fails to convince on an emotional level (it's impossible to believe that Ronny wouldn't just tell Beth, for one thing), not least because it doesn't have the guts to follow through on its set-up, so the ending feels like a massive cop-out. Vince Vaughn has made a career out of playing obnoxious-but-likeable characters, but the sub-standard script makes it difficult to warm to Ronny and the film suffers as a result. Similarly, James (who was brilliant in Hitch but has struggled to repeat that success) is on auto-pilot throughout while Queen Latifah contributes an unnecessarily crude cameo that falls horribly flat and seems to belong to a different film. On the plus side, it's a treat to see Winona Ryder back on the big screen and she's superb as Geneva, though it would have been better if the film had let her just be flat-out evil. However, the whole thing is completely stolen by Jennifer Connelly, who's utterly adorable as Beth and delivers a performance that is far better than the film deserves, despite being saddled with the least important character. If you're a man of a certain age, then a film with both Winona Ryder and Jennifer Connelly in it is obviously going to exert a certain appeal but for everyone else, The Dilema is a huge disappointment that fails as both comedy and drama.